Hello, I want to thank Amanda for her wonderful handprint blog. She finds so many wonderful ideas for all of us mothers looking for ways to keep precious memories of our children. I would also like to thank her for giving me this opportunity to introduce my business Clayful Impressions. Clayful Impressions is a online handprinting shop located on Etsy. I send out a no frill, easy handprint mold kit to make prints with your baby, child, or pet. You send back the mold and I will create a beautiful ceramic keepsake with the print you made with your child or pet. 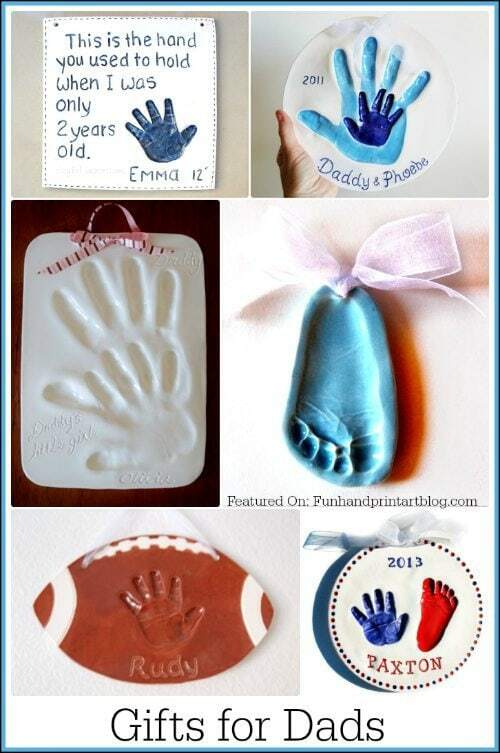 Ceramic handprints take up to 8 weeks to make. They are fired in the kiln twice for a glass like finish. This handprint keepsake pulls at Dad’s heartstrings when he reads the adorable quote along with his child’s handprints. The Daddy and Me hands clay hands impression is our most popular gift for Dad. This plaque showcases the love between a Father and his child. A small footprint ornament is a small reminder of time past. Don’t forget the sports dad! Red, white, and blue for the patriotic dad. I have been creating hand impressions and handprints, since my two babies were small. I wanted to offer mothers all over the world wonderful cherished memories that I have always enjoyed. Thanks for sharing your awesome creations!